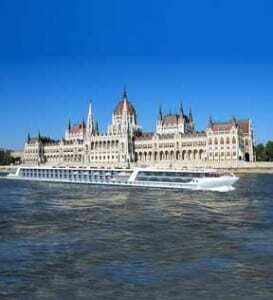 Europe’s newest river cruise line officially launched its website, www.EmeraldWaterways.com, and turned on its reservation phones today as it begins to take bookings for its 2014 inaugural season. Aimed at both experienced travelers and the younger demographic looking for strong value, great pricing, and a near all-inclusive format, Emerald Waterways is offering well-designed eight-to 15-day sailings beginning in April, 2014 at fares that start at CAD $2,255. And to celebrate the launch, the company is offering up to $500 per person savings in airfare costs when Emerald Waterways books the flight and the cruise is booked by October 31, 2013. Emerald Waterways is the first new European river cruise company to set sail in more than six years and its new ships, custom-built to exceed guest’s expectations, will offer such amenities as a heated swimming pool, a movie theater, two restaurants, and a new type of cabin design that replaces the run-of-the-mill French Balcony, common to most ships, with an indoor balcony complete with decked area and an ingenious open-air system. 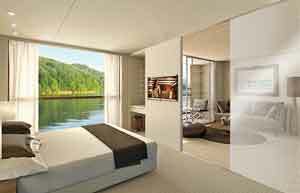 As well as an onboard hairdresser, massage therapy room and fitness area. Emerald Star and Emerald Sky will each carry 182 guests in 72 suites and 20 staterooms, including two built for solo occupancy. Offering exceptional value is one of Emerald Waterways priorities – so all fares include: all transfers to and from the ships; all onboard (and most on shore) meals; a choice of two dining venues; unlimited tea and coffee; wine, beer and soft drinks with lunch and dinner; bottled water in the cabins; continental breakfast, pre-dinner canapés and after-dinner sweet treats served in the top suites; WiFi onboard the ship, at least one included shore excursion almost every cruise day and visits to many UNESCO World Heritage Sites, and more. And while other operators charge as much as $600 per couple for tipping on a 15-day cruise, all gratuities is just another one of the things included on all sailings, as are port charges that normally range from $200 to $400 per person. As part of the Scenic Tours Group, Emerald Waterways is also backed by the award-winning expertise of the world’s leading luxury river cruise operator.